Absolute Pressure: is the existing gauge pressure plus atmospheric pressure. At sea level the gauge pressure in pounds per square inch (PSI) plus 14.7 gives the absolute pressure in pounds per square inch (PSIA). Aftercoolers: Are devices for removing the heat of compression of the air or gas after compression is completed. They are one of the most effective means of removing moisture from compressed air. 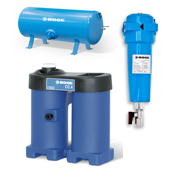 Air Receivers: Are tanks into which the compressed air or gas is discharged from the compressor. Receivers help to eliminate pulsations in the discharge line and also act as storage capacity during intervals when the demand exceeds the capacity of the compressor. Use proper size tank as furnished and/or recommended by manufacturer. Do not reduce tank size or restrict discharge air line from compressor tanks. Booster Compressors: Booster compressors are machines for compressing air or gas from an initial pressure, which is above atmospheric pressure, to a still higher pressure. Compressed Air: is free air that has been pressed into a volume smaller than it normally occupies. As compressed air exerts pressure, it performs work when released and allowed to expand to its normal free state. Compression Efficiency: is the ratio of the theoretical horsepower to the actual indicated horsepower required to compress a definite amount of gas. Displacement of a Compressor Cylinder: is the volume swept through by the piston. This is usually expressed in cubic feet per minute. Displacement of a Multi-Stage Compressor: is that of the first stage only, since the same gas passes through all stages in series. Double-Acting Compressors: are those in which compression takes place on both strokes per revolution in each compressing element. Enthalpy: (Heat Content) The sum of the internal and external energies. Entropy: A measure of the unavailability of energy in a substance. Free Air: Free air is defined as air at atmospheric conditions at any specific location. Because the altitude, barometer, and temperature may vary at different localities and at different times, it follows that this term does not mean air under identical or standard conditions. Gas: While from a physical point of view a gas is one of the three basic phases of matter, and thus air is a gas, a special meaning is assigned in pneumatics practice. The term gas refers to any gas other than air. Gauge Pressure: The pressure on the gauge measured above atmospheric pressure (PSIG); that is, that measured on a given gauge, not effected by altitude or atmospheric pressure. Horsepower, Theoretical, or Ideal: The ideal, or theoretical horsepower of a compressor is defiled as the horsepower required to compress adiabatically the air or gas delivered by the compressor through he specified range of pressures. Inter-Coolers: These are heat exchangers for removing the heat of compression between stages of a compressor. They usually condense and remove a considerable amount of moisture as well. Load Factor: This factor is the ratio of the average compressor load during a given period of time to the maximum rated load of the compressor. It applies also to air tools, where it is the product of the work factor times the time factor. Low Pressure Orifice Test: is a method of accurately measuring the air delivered by the compressor. It is the method recognized by the Compressed Air and Gas Institute and Bureau of standards. Mechanical Efficiency: is the ratio of the indicated horsepower in the compressing cylinders to the indicated horsepower in the power cylinders, in the case of steam-driven or internal combustion engine-driven compressors, and to the brake horsepower delivered to the shaft in the case of a power driven machine. It is expressed in percent (%). Moisture Separators: are devices for collecting and removing moisture precipitated from the air and gas during the process of cooling. Normal Air: The term used for average atmospheric air at sea level in a temperate zone where it contains some moisture. It is defined in the ASME Test Code For Displacement Compressors as being at 14.696 PSIA, 68°F, 36% RH, and weighing 0.075 lb/cu ft. The K value is 1.395. 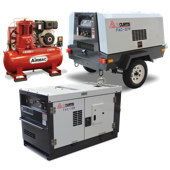 Portable Compressors: are those consisting of compressor and driver so mounted that they may be readily moved as a unit. Positive Displacement: A machine where successive volumes of air or gas are confined within a closed space and pressure is increased as the volume of the closed space is decreased. Pressure (PSI): Pounds-Per-Square-Inch: A rating of Air Pressure in the system. Pressure Discharge: Discharge pressure is the absolute total pressure at the discharge flange of a compressor. Pressure, Intake: Intake pressure is the absolute total pressure at the inlet flange of a compressor. Pressure Rise: This is the difference between the discharge pressure and the intake pressure. Pressure Static: Static pressure is the pressure measured in a flowing stream (liquid or gas) in such a manner that no effect on the measurement is produced by the velocity of the stream. Receivers: Receivers are tanks used for the storage of air discharged from compressors. They serve also to damp discharge line pulsation's. Reciprocating Compressors: are those in which each compressing element consists of a piston moving back and forth in a cylinder. Seals: Seals are devices used between rotating and stationary parts to separate, and minimize leakage between, areas of unequal pressures. Single-Acting Compressors: Machines in which compression takes place on one stroke per revolution in each compressing element. Single-Stage Compressors: Machines in which compression from initial to final pressure is complete in a single step or stage. Two-Stage Compressors: These are machines in which air or gas is compressed from initial pressure to an intermediate pressure in one or more cylinders or casing. Volumetric Efficiency: The ratio of the actual inlet capacity (ACFM) to the first stage displacement expressed as a percentage. Volumetric efficiency varies by clearance or blow-by, heating losses, valve losses, and specific gravity of gas being compressed. 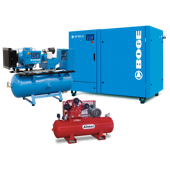 Water-Cooled Compressors: These are machines cooled by water circulated through jackets surrounding the cylinders or casings.